Did you know that Dubai has introduced new ferry service from Dubai Marina to The Dubai Mall? Yes, you heard it right. Gone are the days when you use to travel via road and metro to reach the city’s most popular tourist spot such as The Dubai Mall and Dubai Marina. Now you can take a ferry instead of bus, taxi, car, and metro as The Roads and Transport Authority (RTA) has launched a new service connecting these hotspots of the city. The duration of the journey will be approximately 1 hour and 20 minutes each way. The price of ticket is more costly than a taxi which is AED 68.25 per adult, AED 52.50 for children from 5 to 12 and infant under 5 travel free of charge. However, it is worth the amount as the ferry route offers a scenic view by going pass through the iconic Dubai Water Canal, The Palm Islands, and beautiful sights of the sea. The ferry will run from Dubai Marina ferry station which is behind Dubai Marina Mall to Al Wajeha Al Maeyah and then return back to Dubai Marina station 15 minutes later. There will be a shuttle service that will run from Wajeha Al Maeyah to Dubai Mall and back so that ferry passengers have a direct route to Dubai Mall. 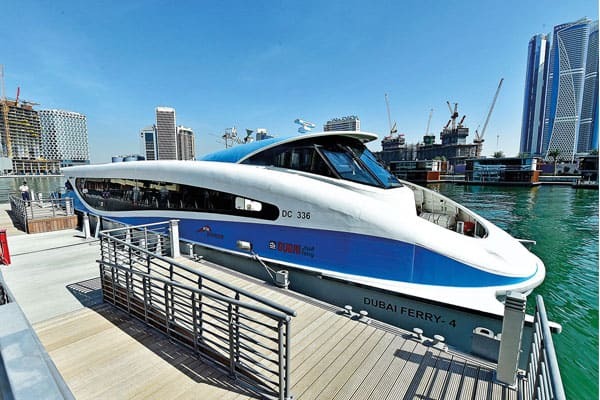 Where to buy ferry tickets for the route Dubai Marina to The Dubai Mall? Tickets can be purchased from At The Top, Burj khalifa, from the guest service desks at The Dubai Mall and Dubai Marina Mall or burjkhalifa.ae as well as from the ferry stations. The ferry will leave once a daily from Dubai Marina at 3.15pm and 4.30pm and The Dubai Mall at 4.45pm and 6pm daily. I am very excited about this ferry service and can’t wait to try? What about you? I’d like to hear from you. So go ahead and leave a comment below. Under 5 years is free?? First of all, I would like to thank for you asking this question as I did not mention anything about this in the blog post. Yes, infants can travel free of charge. As I understand the ticket its for 2 ways (return) so can I used for twice time? Like If I want to reach dubai mall and stay there some times can I use a return for another day? No, the charges are given for the one-way ticket, not for the return ticket.